You have come to the right place if you are looking for fun, engaging and exciting Octopus themed activities to do with toddlers, preschoolers and kindergartners. 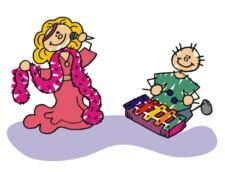 Our activities are used by teachers, moms, dads, child care providers and more! Have the child scrunch up a piece of newspaper and place it inside the paper bag. Tightly wrap the rubber band around the bag at the base of the newspaper. Cut up the bag to make eight strips for octopus tentacles. Use a marker to draw octopus’s eyes and mouth on head. Stick reinforcements on the tentacles. 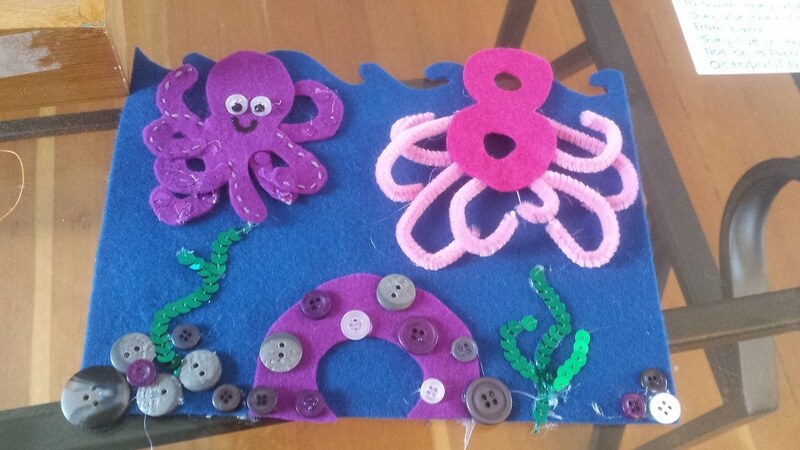 Cut up an old bath mat (the kind with the suction cups on the bottom) Cut into strips for tentacles. It’s fun to use them in the sensory table with water. Cut a paper plate in half. Glue eight streamers on the back for tentacles. The kids can color the plate to match the color of the streamers or use whatever color they want. The children put a blue hand print on a piece of paper. Turn it upside down and let the children put Fruit-Loop eyes, 1/2 a red Fruit-Loop for the mouth and Fruit-loops or cheerios for tentacles. You can help each child by painting their hand and 4 fingers blue, have them spread their fingers and put the hand print down, then move their hand slightly to put 4 more legs in. Using a paper plate have the children paint blue or gray. Then add streamers for legs and hang from ceiling. 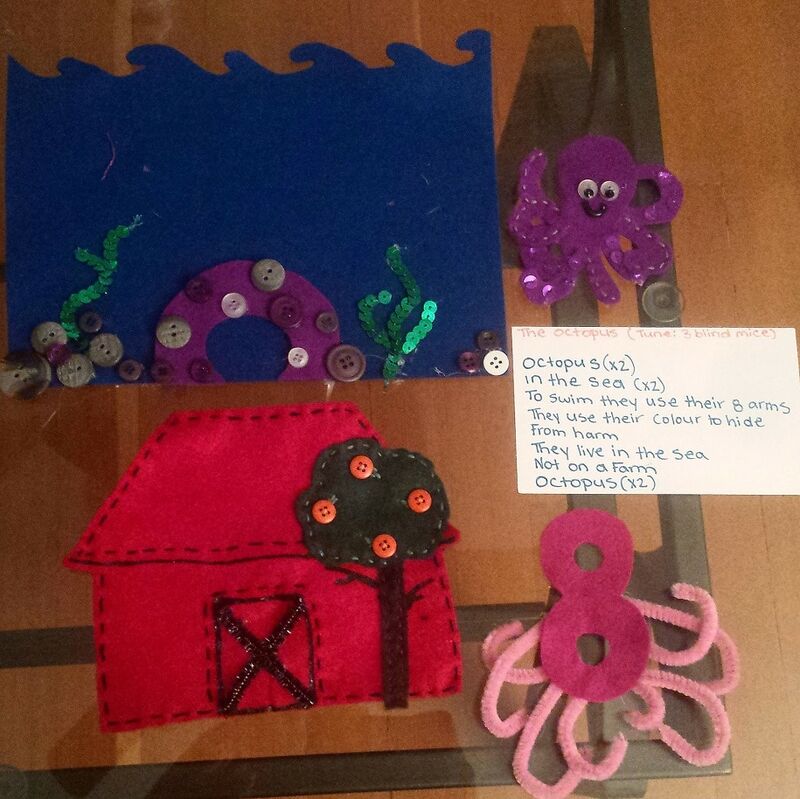 Have the children cut out a half circle from construction paper or cut a paper plate in half for an octopus body. Let the children use crayons to draw eyes. Then have them each glue eight pieces of white crepe paper to the bottom edges of the octopus bodies to make arms. Hang the finished octopi from a string stretched across a window and watch them “swim” as air moves through the room. Glue together two cup sections from the bottom of a cardboard egg carton, and let them dry. Cover them with black paint. 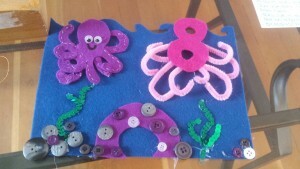 Attach eight yarn tentacles with glue to the bottom. Cut eyes and a mouth from paper, and glue them in place. Brown trash bags, Glue, Scraps of construction paper, Picture of an octopus, Newspaper, Styrofoam packing half circles, Tape At circle time show the children a picture of an octopus. 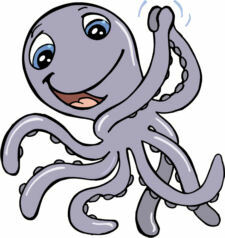 Discuss the characteristics of the octopus: color, size, how many arms, how it moves. Make an arm by stuffing a trash bag with newspapers filling only half of the bag lengthwise. Tie the bags. Fold the other side of the trash bag over the stuffed side and tape it, making a large narrow arm. Using the Styrofoam packing half circles, have the children glue them to the bottom of each arm representing the octopus’ suction cups. Make the head by stuffing the entire bag with newspaper and use construction paper scraps to make the facial features of the octopus. When the eight arms are finished, tie them together and then tie them to the stuffed head. 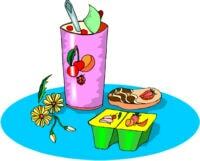 Get a variety of colored powder paint and lots of oatmeal. Give each child a small sandwich bag with some oatmeal in to. Let them choose any color powder paint put about a tablespoon of paint into the bag, close and shake! Do this for all the colors you want. When you are ready to do the project give each child an octopus pattern and their choice of colored oatmeal, any and all colors! Spread the glue and put the oatmeal on! Cut out one cup of an egg carton, paint it pinkish purple. Attach 8 paper arms. Blow up a purple balloon and tie it. Let the children count out and attach 8 purple streamers to the tied end and stick reinforcement circles to the streamers for the tentacles. You can also use them for the eyes! The people that get tagged by the octopus become frozen taggers. They are allowed to pivot on one foot and tag people as they run by. The last person caught is the new octopus. Mark a goal line at each end of playing field. Choose a child to be the octopus, the rest of the children are fish. The object is for the octopus to catch the fish by tagging them with a sponge ball. If a child gets hit they must freeze and become an octopus tentacle. The tentacle may help the octopus by using their hands outstretched to tag fish. Only the octopus may move however. To begin playing, all fish line up at one goal line. The octopus calls out,”Fish, fish, swim in my ocean.” At this command the fish must try to cross the ocean without getting caught. The last one to be tagged is the next octopus. Where do octopus’ live? What do they eat? Cut out and laminate pictures of real octopus’ and discuss their features. An octopus has 8 arms called tentacles. These arms are webbed together by a layer of skin called a mantle. Under this layer of skin are color cells that make the octopus look white, grey, orange, red, or brown. Being able to change colors can help the octopus catch its dinner. It’s bright colors attract and confuse other sea animals. When they swim closer to look at the octopus, he catches the animal for his dinner. There are rows of suction cups along the edges of the arms that stick to objects and help the octopus pull itself along and move. When the octopus is in danger, it can squirt a cloud of black ink so the animal can’t see it. Then it swims away fast. If one of the tentacles gets caught or bitten off by an animal, like a shark, it will grow back in a few weeks. Octopus eggs are very tiny (microscopic), about the size of a grain of rice. Mother octopi lay about 1000 eggs at a time. She cares for them in a nest she builds under rocks. Once the eggs hatch, the mother dies. Sadly, her work is done. Who could belong to so many feet? The octopus does and they help him eat. Once I saw an octopus down deep in the sea. Then out came her eight arms to swim with me! Special thanks to Larisa Catto for this contribution!